When you accept online payments for your events, they are subject to online payment service fees, which are always composed of credit card processing fees and usually some kind of an online service fee. In order to process any credit card payment, whether online or in a physical location, merchants always have to account for payment processing service fees. If you are new to this process, learn How Credit Card Transaction Processing Works — Steps, Fees & Participants. These payment service fees are directly deducted by banks / credit card companies during the payment transaction, and cannot be avoided. Payment processing fees and online service fees are part of running a business, and are considered a business expense. However, if you would like to save on these fees, you can try to minimize them or pass them on to your customers to pay. Described below are three ways of how you can achieve this to save on these fees. Minimize Fees: Find the most cost-effective online registration service. There are many companies that offer online registration and payment services for events. However, their pricing, features, value, and ease of use vary tremendously. This is why the first thing to consider, in order to save on online payment service fees, is what the best and most cost-effective service will be for your needs. Some event registration platforms provide services based on monthly plans that you would commit to, based on your business needs. These can range from moderate to very high monthly costs, and are usually not a good idea if you don't offer events regularly or if you offer small-sized or low-cost events. Some event registration services take a percentage fee per transaction of your total event price. This may be a good option if your event price is very low but will add up significantly if your event price is moderate to high. Some event registration services charge a flat fee per transaction without any monthly commitments and irrespective of your event ticket price. 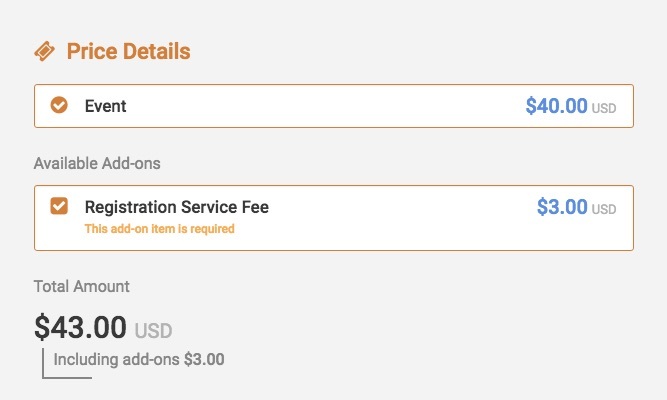 As long as this fee is low and your event price is not too low (less than $10), this option will usually provide the most savings and flexibility. This is how Corsizio operates, as we aim to provide the most flexible and cost-effective solution with our low-cost flat $1 service fee for online registration payments. Keep in mind that in addition to their own service fees, all service providers must charge the credit card processing fees. Sometimes these are bundled into the total percentage fee, but normally they are extra on top of any monthly, percentage, or flat service fees. Minimize Fees: Use a deposit feature for high cost events. Credit card payment processing service fees vary by country. They typically range from about 1 to 3% of total price, plus around $0.15 to $0.30 extra. Corsizio uses Stripe to process payments on your behalf, and Stripe charges standard credit card processing fees, which you can find here listed by country. You can lower these fees and save money, while still securing attendee registrations to your events by using the deposit feature , where you only request a small amount of your full event price to be paid upfront. This provides you with the opportunity to pay online payment processing fees on a smaller amount than the total price of the event, and collect the remainder by cash, cheque, or a bank transfer. Some business owners choose to save on payment processing fees by having their customers pay for them as part of the transaction. This can be done in one of two ways, where either the fees are masked or are directly exposed for the customer. Using this method you would include the online payment processing fees as part of the total cost of an event registration. This is the preferred choice if you think your attendees may be discouraged from registering to your event if they see an extra cost. To do this you need to raise the price of the event by the amount needed to offset the payment processing fees. Therefore, you would charge $516.27, or round up or down depending on your preference, to present your attendees with a round number like $515, $517 or $520. You will notice that this amount is slightly more than the $500 plus $14.80 if you would do a straight-forward calculation, as you must keep in mind that the fees in this case need to be adjusted in a way that gives you the full $500 in the end. Using this method you would add the online payment processing fees as an extra cost to the price of your event registration. However you may choose to save on payment processing fees, be sure that you factor in and consider all of your variables. For example, the effort required to pursue or adopt a certain money-saving solution may not be worth your time. In other cases, your event's audience may or may not care if the event price is slightly more or less. Therefore, it is important not to lose sight of the final goal, which is to have successful events that you enjoy planning and hosting, along with an easy online registration and payment process for your attendees.